The Right to education as a crucial part of an individual’s life is legally guaranteed for all without any discrimination. Despite the many interventions, international and national pol-icies and legal instruments to promote gender equity in education, participation in educa-tion including higher education is still constrained for young mothers who suffer pregnancy related exclusion. 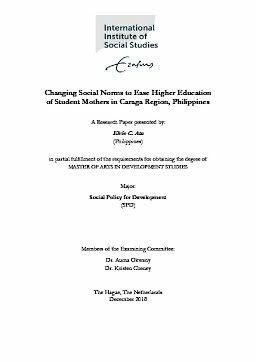 This research is an attempt to make visible the constrains and experienc-es of single student mother from Surigao City, Philippines and their efforts to realise their rights to education. By examining the policy environment that defines the education of sin-gle student-mothers and their experiences in school, this research reveals how social norms and other factors influence the implementation of a policy protecting the education of all females including pregnant young women. The research findings point to the intersecting challenges that these young student-mothers face which are shaped by social norms and the powerful rules and regulations of a religious-based institutions that undermine the imple-mentation of the policy.